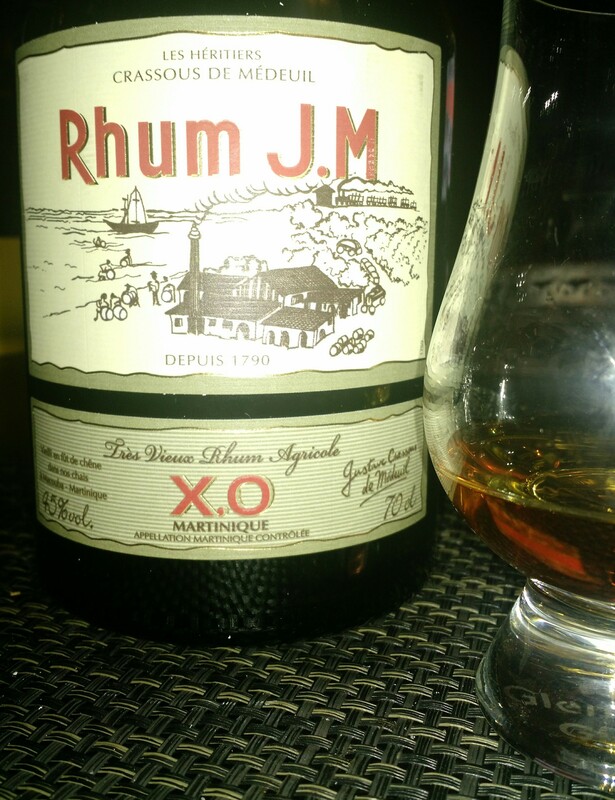 Have you found an online vendor selling Rhum JM XO? It's a complex rum, great notes, great finish, very persistance, a lot of fruits in my nose. If you really like Rhum Agricole's, then add 3 to my score. 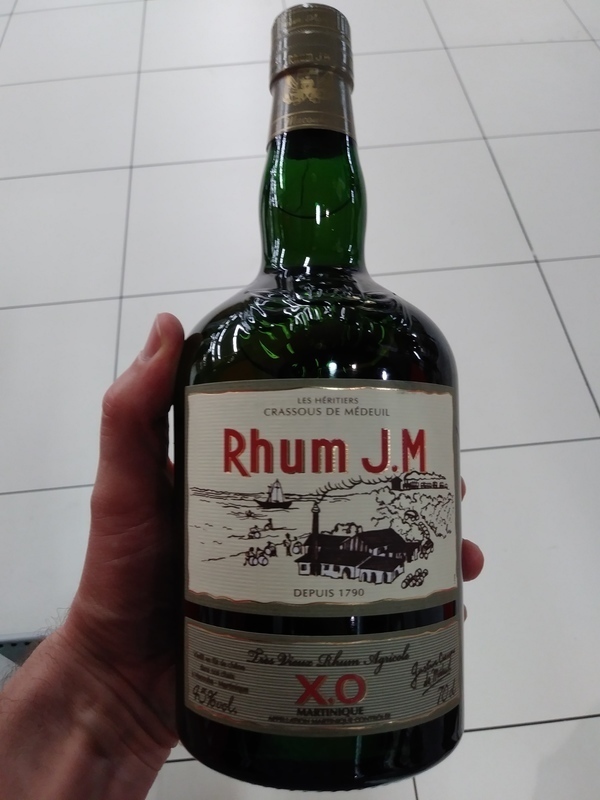 Otherwise, if you enjoy sweet aged rums, the Rhum J.M. XO is super dry, like a desert. The flavor profile is very strong, but unmemorable. There is surprisingly strong burn at the end, and you will only remember the alcohol burn. I compared this side by side with the JM VSOP Rhum. Although this is more expensive, I prefer the VSOP. This was stronger at 45% (vs 43% for the VSOP), but the VSOP seemed to have more flavor to it. I enjoy strong rums if they're really good. But I didn't find this to be really good. Smells and tastes of bourbon, charred oak, pepper, and a little cinnamon. This seemed harsh to me, and lacked a sweet rum flavor (too dry for my liking). Again, at 45%, I found this strong for what it is. Strong rums need to be great (like the 47% Diplomatico Ambassador Rum). Great nose but very sour initial agricole hit with almost no spice. Woodsy finish that improves the taste slightly but still not great. Intense high alcohol nose, with banana, caramel, woood, nutmeg and vanilla. Powerful smooth pallet. Earthy, nutmeg, pepper, sweet citrus and toffee. A very nice and intense rum. Dry agricole with lots of wood. Good, but I fail to find anything memorable about it. Zlatožlutá barva moku předjímá svěží závan citrusových plodů, které se v letmém přivonění nenásilně mísí s jemným aroma čerstvě prolisovaných bílých hroznů. Pokud se čichové fázi věnujete ještě důkladněji, rozeznáte i alkoholový podtext shodný s českou vínovicí či italskou grappou. Samotné tělo vámi propluje velmi rychle a lehce svou ovocnou příchutí, občasně doplněnou i náznakem vanilky (myšleno skutečné vanilky, nikoliv vanilkové tresti). Přestože osobně preferuji rumy samotné a bez ledu, věřím, že na tomto specifickém agricolu dokáže kreativní barman postavit i velmi zajímavé mix-drinky. Nous avons eu la chance de le déguster sur place. Au nez il semble rond et laisse présager de la douceur. On sent la vanille et le caramel. Pas sucré mais juste ce qu'il faut de douceur. I love it. This is kind of stuff. Go Go get it now. 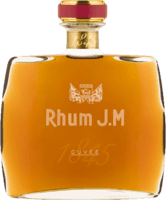 Rhum J.M. XO tastes like many other Agricole but less aggressive, so that’s why I think it’s a good agricole to start with. The flavour are very elegant and you can for example smell citrus, salvia and exotic fruits. In your mouth you will recognise pepper, musqot, cinnamon and a lot of oak. If you want to test Agricole, try this one! 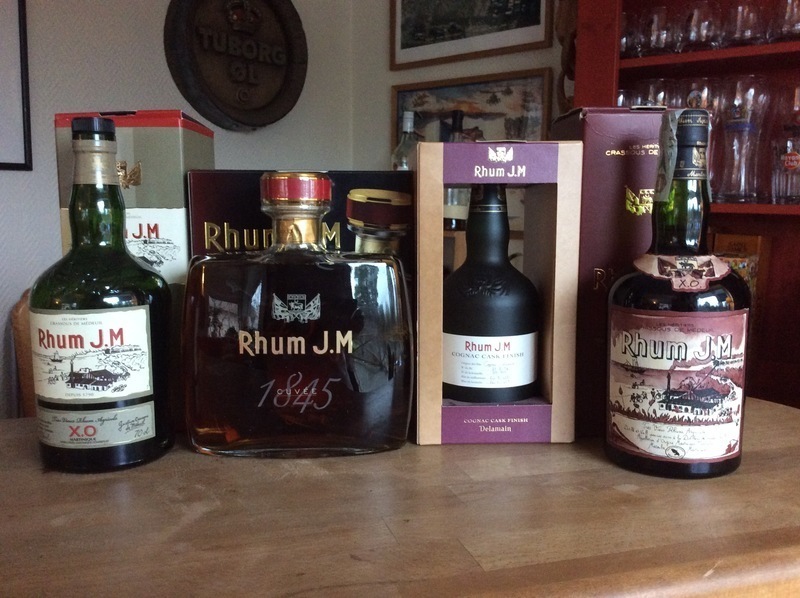 Picture: My Rhum J.M shelf. Toasted coconut husk with leathery and ashy notes. Nutty warm butter follow by zesty orange peel. Flavour of caramel with pleasent vegetal ashy which you won't miss on aged agricole. Fruity (dried apricots), dry and woody with touch of spiciness. Peppery citrus and really enjoy the dry oak/ cedar wood on the finishing. Ginseng bitter sweet towards the very end. It is probably more difficult to drink but the experience is amazing. 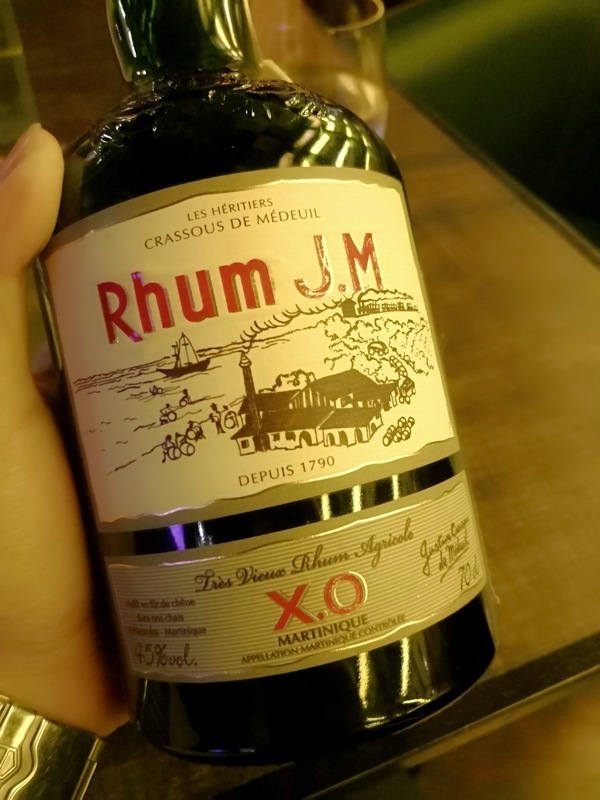 Rhum J.M XO is full bodied agricole rum with no compromises; give it a chance if you are looking for a next level rhum experience. If you have never drunk rhum agricole before I would rather recommend you Clément VSOP. Un rhum bien fait, bien vieilli, une valeur sur de l'Agricole martiniquais. Selvom det er en rom, så minder den mere om en cognac, men det er jo ikke så mærkeligt, når den også lagres på fade af limousine træ. Slet ikke som andre typer rom, og helt sikkert spændende med Agricole, som er lavet på sukkerrørssaft. Tør og bidende, men på en god måde. Goldenes Bernstein mit kupferfarbenem Lichtspiel im Glas. In der Nase, frisch aufgeschnittene grüne Äpfel mit weissen Traube garniert auf einem getoastetem Eichenbrett. Frisch und einladend, man freut sich auf den ersten Schluck. Im Gaumen, typisch Agricole mit einem kräftigen ehrlichem Auftritt (45%) ohne jedoch die Geschmacksknospen zu lähmen, nein im Gegenteil die werden schön stimuliert und sind bereit die Aromen aufzusaugen. Frische gelbe und weisse Früchte wie Äpfel und Birnen umschmeicheln die Zunge, das ganze mit weissem Pfeffer und Muskat abgeschmeckt. Man fühlt in die Szenerie der Etikette versetzt. Im Abgang, einfach nur lecker, das fruchtige hält an und schwimmt mit einer leichten Süsse davon. Auf der Lippe bleibt eine angenehme pfeffrige Würze. Ein ursprünglicher Rhum ohne Firlefanz, für Einsteiger und Liebhaber von Rhum Agricole sicher eine gute Wahl, herrlich an einem lauen Sommerabend. Golden amber with copper colored light in the glass. In the nose, freshly cut green apples with white grapes garnish on a toasted oak board. Fresh and inviting, one is looking forward to the first sip. In the palate, typical Agricole with a strong honest appearance (45%) without however paralyzing the taste buds, no on the contrary they are stimulated beautifully and are ready to absorb the flavors. Fresh yellow and white fruits like apples and pears flatter the tongue, the whole seasoned with white pepper and nutmeg. You feel transported into the scenery of etiquette. In the finish, just delicious, the fruity holds on and floats with a light sweetness of it. On the lip remains a pleasant peppery seasoning. An original Rhum without trumpery, for beginners and lovers of Rhum Agricole certainly a good choice, wonderful on a warm summer evening. Interesting charcoal taste. A bit of a bite, but very nice. Het gekapte suikerriet wordt binnen een uur geperst en het sap in de fermentatie tank gepompt. Na een korte vergistingaperiode wordt er gedistilleerd in dubbele column stills. Een aantal jaar op ex-bourbon vaten later levert een rhum op met die typische 'grassige' agricole smaak maar ook eikenhout en specerijen als peper, nootmuskaat en kardemom en fruitige tonen als annanas. Een lichte en droge rum gebotteld op 45% abv (die merk je op) waar niet mee 'geknoeid' is want dat is tegen de wet op Martinique. but still excellent. Sage and other spices, the finishing of some sweet white wine. Not to forget the bourbon that was in the barrells before. Probably not to everybody's taste, though. Not very exciting, its an ok expression, but it falls a bit short.